CO2 emissions rule when it comes to executive cars. Company car bosses like to cut costs and the easiest way to do that is to reduce emissions. That typically means a diesel engine – but Lexus does things differently. Its latest GS 300h model aims to take the fight to German cars like the BMW 520d, but with a petrol-hybrid engine instead of a diesel. On paper it all adds up – the combined output of the 2.5-litre petrol engine and the 105Kw electric motor is 223PS, but CO2 emissions are 109g/km for entry-level SE models, rising to 115g/km for the F Sport. So despite being a big and fairly powerful luxury saloon, annual VED is the same price as you’d pay for many small hatchbacks. Fuel economy stacks up well too – the official figure for the most frugal SE model is 60.1mpg, which is competitive with cars like the Audi A6 2.0 TDI and Mercedes-Benz E220 CDI. However, because the GS 300h runs on petrol it comes with the added advantage of cheaper costs at the fuel pumps and a lower Benefit in Kind (BIK) company car tax rate. Using our company car tax calculator shows that a company car driver would pay £68.12 per month for the GS 300h SE on a 20 per cent tax rate – compared to £103.53 per month for a Mercedes-Benz E220 CDI or £89.32 per month for the BMW 518d SE. Those savings add up over a couple of years. The Lexus is even competitively priced. Entry grade SE models are £31,495 on the road, rising to £43,745 for the top Premier model. Even the base-spec car is fairly well equipped, with electrically adjustable seats, 12-speaker DAB enabled audio, cruise control, Bluetooth, alloy wheels and LED running lights. Niceties like leather seats and navigation are offered as options at this grade, but as standard on higher grades. You also get the benefit of an automatic transmission as standard on the Lexus GS 300h. To someone looking at the figures on paper it makes a very good case for itself. However, as with all things, the proof is in the pudding. The GS 300h might look ideal to a bean counter but it’s not much use if it falls flat in the real world. Thankfully, for the most part it’s an impressively comfortable car that should appeal to most drivers. That starts from the moment you climb into the cabin – it’s very nicely laid out. The focal piece is an analogue clock, above which there’s a huge digital display for all the navigation and media systems. This is controlled by a computer mouse style knob next to the gear selector, which is nicer to use than the rotary dials in German cars once you get used to it. Rear passenger space is adequate if not exceptional, and there are some nice creature comforts like dedicated air-con controls for back-seaters. The driving position is comfortable, with plenty of adjustment and, if leather is specified, the seats are both heated and ventilated, which is a nice touch. Add to that a general feeling of solidity and quality and there’s plenty to like. All variants have a push button start and as this is a hybrid, you have to consult the instrument binnacle to know you’re ready to move off – it’s silent. There’s no noise when stationary or moving at low speed because typically in those situations the car will operate on battery power alone. The onboard computer will decide whether to run with electric power or a combination of engine and electric power depending on the situation. It’s always seamless and smooth thanks to the CVT automatic gearbox. It’s a hushed, relaxed car to drive in almost situations, but it’s most at home on big, open roads like motorways. However it’s not without its flaws - the engine starts to grumble a little when you task it with an overtaking manoeuvre, or when getting up to speed quickly on a slip road. 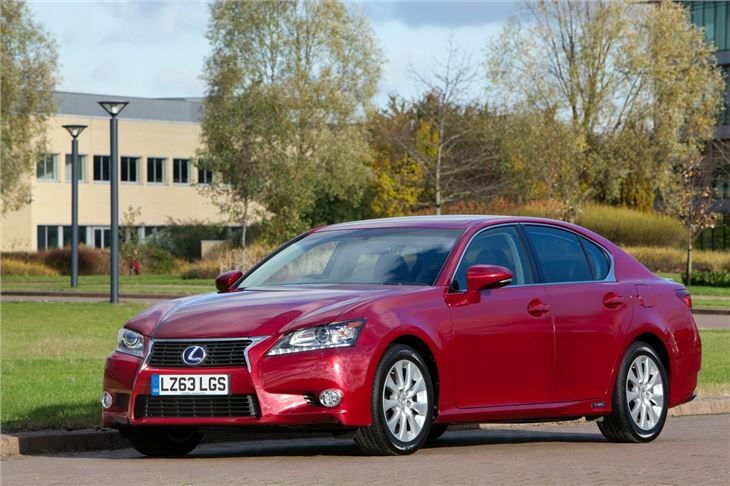 In fact, pressing on with any pace is a problem with the GS 300h. It might have 220PS but it doesn’t feel particularly powerful or swift and that’s largely down to the CVT transmission, which is better suited to gentle driving than to hard acceleration. 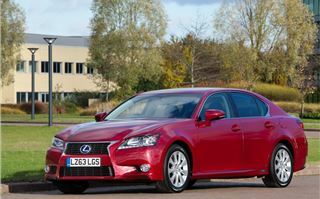 Indeed if you’re an enthusiastic driver the GS 300h is best avoided - it’s not the most dynamic of cars. The steering doesn’t offer masses of feedback and while there are paddles to take control of the gearbox they’re pretty much pointless. However, the car’s relaxed character is helped by a comfortable suspension set up which irons out most lumps and bumps, even over quite rough surfaces. The only thing that lets the refinement levels down a little is the bearable but noticeable amount of road noise, which is caused by specifying larger alloy wheels like the 19-inchers on the F-Sport. All versions have selectable driving modes with Eco, Normal and Sport and EV settings. Those who pick F-Sport or Premier models get a Sport+ setting too, which stiffens up the suspension, but in everyday use there’s no reason to choose anything other than Normal – even in Sport mode you’re not going to have a huge amount of fun. So while the GS 300h might not be the most exciting car to drive on a country lane it’s great everywhere else. Add to that the appeal of low running costs and affordable company car tax and there’s plenty to like. Not everyone will find it as appealing as its German rivals, but those who do have nothing to lose.